What Are Stuffed Chicken Thighs? A popular stuffed chicken thigh meal is chicken Cordon Blue, which has a ham and Swiss cheese filling. 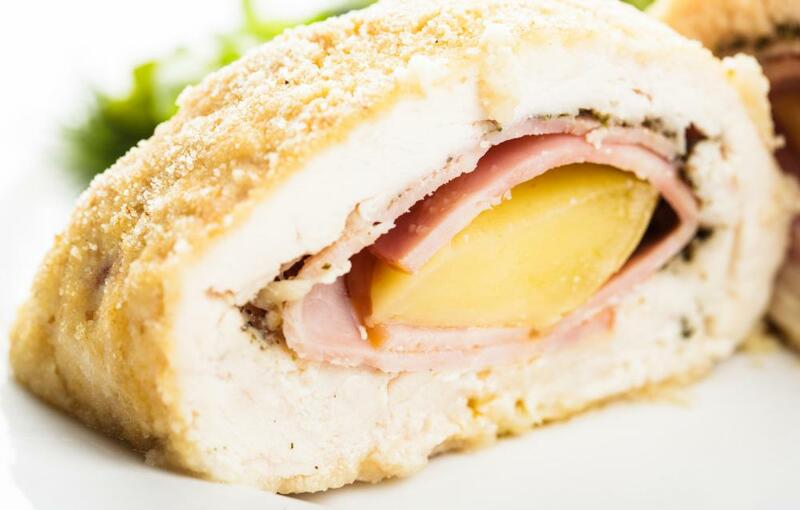 Chicken can be stuffed with slices of ham and cheese to create Chicken Cordon Bleu. Chicken thighs are commonly prepared to include the bone and skin. With some preparation, its bone can be replaced with a variety of other edible ingredients and cooked in a number of different ways. The results are stuffed chicken thighs. In comparison to other cuts of the chicken, such as its wings and breast fillets, the thighs are generally less popular. The meat contains a comparatively good deal of fat and connective tissue, something that is commonly avoided, though these same components, however, make the thighs one of the most flavorful parts of the chicken. To prepare stuffed chicken thighs, most people remove its skin. Many people also opt to trim as much fat off as possible. When the thigh bone is then removed with a boning knife, the meat will have flayed and flattened into a large fillet. Some markets may sell chicken thighs already de-boned to ease the cooking process considerably. The stuffing for the chicken is limited only by culinary creativity. 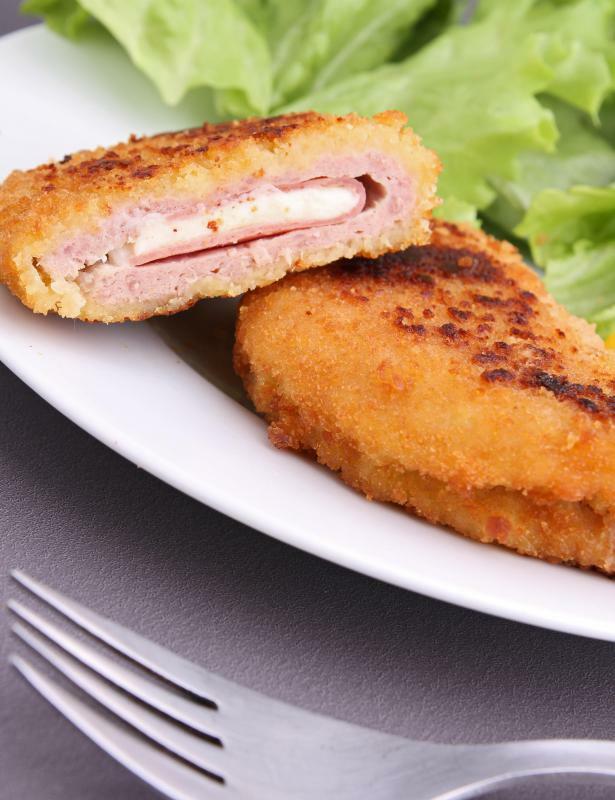 A classic combination called Cordon Bleu is slices of ham and Swiss cheese. Other cheeses are also popularly combined with herbs or vegetables, such as Parmesan and spinach. Nuts, mushrooms and seasoned bread crumbs can also be found in stuffed chicken thighs. Most mixtures are savory, possibly spicy, but sweet ingredients such as fruit are sometimes used. There are two ways to assemble this chicken dish. The meat can be folded back together, closely approximating the thigh’s original shape. Alternately, the meat may be pounded with a mallet to an even thickness, and the stuffing is spread in a thin layer. The chicken is then rolled into a log shape and held together with either string or toothpicks during the baking process. The method of cooking stuffed chicken thighs depends primarily on the stuffing. A mixture containing cheese, for example, would not be braised in a liquid. The package might be coated in flour, breading or batter for a crusty exterior. Oven baking and stove top pan frying are most common, though it can also be grilled with sauces added for additional flavor. When presented on a plate, the chicken’s appearance can be both familiar and comforting. When it is sliced, however, the dish can become something exotic and adventuresome. Whether as a meat sandwich of stuffing, or as spiral medallions of alternating meat and stuffing, there is the delicious anticipation of perhaps a new flavor combination. What Are the Best Tips for Frying Chicken Thighs? What Are the Best Tips for Making Chicken Thighs in the Crock-Pot®? What Are the Best Tips for Making Chicken Kiev? What Are the Best Tips for Baking Chicken Thighs? What Are the Best Tips for Boiling Chicken Thighs? What Are Stuffed Chicken Wings?